Biserica Ortodoxă a Greciei este una dintre bisericile ortodoxe autocefale, a cărei jurisdicție se întinde în toată Grecia contemporană, cu excepția acelor părți care depind de Patriarhia Constantinopolului (Insulele Dodecanez și Creta). Biserica este condusă de Arhiepiscopul Atenei și Întregii Grecii. Primatul Bisericii Greciei este Preafericitul Ieronim al II-lea, Arhiepiscop al Atenei și Întregii Grecii din anul 2008. Primul contact al grecilor cu Hristos este relatat de autorul celei de a patra Evanghelii. Acesta scrie că niște greci dintre cei care veneau de Paștele evreiesc la Ierusalim s-au apropiat de Filip și de Andrei și au cerut să Îl vadă pe Iisus (Ioan 12, 20-24). Grecii, ca unii care căutau adevărul, doreau să asculte ceva nou și să Îl întâlnească pe noul Învățător. Iisus știa că grecii care veniseră la El erau oameni cu o minte iscoditoare și cu sufletul tulburat. Întâlnindu-i, exclamă: "A venit ceasul ca să fie preaslăvit Fiul Omului!" (Ioan 12,24). În acești elini care veniseră la El, Hristos îi vedea nu numai pe greci, ci și pe romani, pe sciți și toate celelalte popoare din alte timpuri și din alte locuri care aveau să Îl caute. Iisus a spus astfel că era timpul ca Evanghelia să fie propovăduită și dincolo de granițele vechiului Israel. The Greeks have played a major role in the kerygma and the didache of Christ. The Greeks found in the person of Christ the eternal Logos and the "unknown God" of their forefathers, while Christ discovered in them sincere followers and dedicated apostles of the New Kingdom. In the history of the Greek Orthodox Church four stages of development can be distinguished. The first three centuries, through the age of Constantine the Great constitute the apostolic and ancient period. The medieval period includes almost ten centuries, to the fall of Constantinople. The age of captivity starts, roughly, in the fifteenth century and ends about the year 1830. It is followed by the modern period. The Greek Orthodox Church traces its history back to the time of St. Paul who was the first to preach Christianity in Greece. He visited Athens, Philippi, Thessaloniki, Veroia, Corinth and Crete. Christianity eventually spread through Greece from these cities. In these early days, the Church of Greece comprised a diocese, with Corinth as the centre, known then as Achaia and considered a city of great importance. The Church of Cyprus recognised its autonomy from the Church of Greece during the Council of Ephesus in 431. This was confirmed by the Emperor in 488. Following three centuries of underground existence and persecution in the Roman Empire, it was again the Greek Church, the Greek language, and Greek missionaries that carried the Christian message in both the East and the West. This first period ended in 313 with the edict of toleration, where Constantine the Great divided the Roman Empire and prepared the way for Christianity to become the state religion of the later Roman and Byzantine empires. The geographical area we know today as Greece constituted the diocese of Eastern Illyricum, which was self-governing. For historical and other reasons, the Greeks for many centuries identified themselves solely as Christians and especially during the centuries of captivity under the Turks. This is significant that although the patriarchs of Constantinople and many bishops of the Bulgarians, Albanians, and Slavs were Greeks during the Ottoman period, they did not attempt to Hellenize their congregations: neither did they try to force them to abandon their liturgical traditions and cultures. The term "Hellene" as an ethnic name began to appear among the Greeks of the high Middle Ages, but still was not commonly used. However, all nations living outside the medieval Greek world of the Byzantine Empire, such as the Russians, the Germans, Khazars, the English, the Georgians, the peoples of Italy, and the Franks, called the native inhabitants of the Byzantine Empire "Greeks." The designations "Greek Orthodox" and "Roman Catholic" were unknown in the early and medieval Church, and they took on their distinct meaning only after the eleventh century. By 733 AD, under Emperor Leo the Third, Greece was acknowledged as part of the Ecumenical Patriarchate of Constantinople but prior to this, it was subordinated to the Bishops of Rome. During the Byzantine Empire and the subsequent Turkish occupation of Greece, the Christian church in Greece was under the administration of the ecumenical patriarch of Constantinople. After the Greek War of Independence (1821-32), the provisional president of Greece Ioannis Kapodistrias(1776-1831), began negotiations with the patriarch for the independence of the Greek church. The final decision was made when Otto I (1815-1867), the new king of Greece, feared the Turkish government might still be able to influence the politics of Greece through the patriarchate of Constantinople and as such the Greek church was declared autocephalous in 1833. The independence was formalised by Constantinople in 1850, with some limitations. 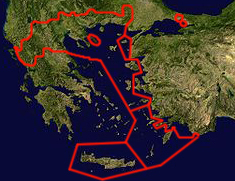 Contemporary map of the Ecumenical Patriarchate's jurisdictions in Turkey and Greece. In 1864, the Ionian islands were added to the Church of Greece and in 1881 the diocese of Thessaly and parts of Epirus were also added. Also in this year, the first Greek Orthodox church was founded in America. Under an agreement made in 1908 between the Ecumenical Patriarchate and the Holy Synod of Athens, jurisdiction of the churches in America was given to the Church of Greece. In 1927, the statutes regarding the Church were modified resulting in the government controlling the church and attending the Holy Synod meetings. So during the 20s and 30s, the turbulent political events in Greece divided the Greeks of America and this resulted in Archbishop Athenaogoras of Corfu to be appointed to head the Greek Church in America. Today the Church of Greece is governed by a Holy Synod, presided over by the Metropolitan Archbishop of Athens and assisted by four bishops chosen in regular succession. The Patriarch of Constantinople is still regarded as the spiritual head of the church and all of the Holy Chrisma used in Greece is consecrated by him. Organised as a state church, similar to the pattern adopted in the Russian church under Peter the Great of Russia, the ultimate authority is vested in the Synod of Bishops under the presidency of the archbishop of Athens and all Greece. A second synod, with the same presidency, consists of 12 bishops, each serving for one year only. The first synod deals with general ecclesiastical questions, whereas the second synod deals with administrative details. The church is divided into 81 small dioceses; some of these, are nominally under the jurisdiction of Constantinople. The majority of the church's priests in Greece do not have a university education, with very little formal training beyond two years at higher seminaries after high school. An up-to-date listing, in order of seniority of ordination, of the Holy Synod can be accessed at the Church of Greece's official website. The Greek language has been known as the "Sacred Language"  of the church from the time of the Apostles and enjoyed its prominence mainly in the early history of Christianity. In scriptural study and to a great extend it is one of the original languages of the Scriptures (the New Testament). ↑ The tradition of the Greek Church has been one of religious toleration rather than nationalism. If this had not been true, the Greek Church, in the Byzantine centuries and especially during the four hundred years under the Turks, could have Hellenized all the minorities under her aegis or at least a great majority of them. ↑ The Greek historian K. Paparigopoulos, known for his patriotism, blamed the Church for not exploiting here numerous opportunities to Hellenize the various Balkan peoples in a period of four hundred years, something she could have done without much difficulty. The Greek Church reminds us of the time when the tongue, not of Rome, but of Greece, was the sacred language of Christendom. It was a striking remark of the Emperor Napoleon that the introduction of Christianity itself was, in a certain sense, the triumph of Greece over Rome; the last and most signal instance of the maxim of Horace, Graecia capla ferum victorem cepit (captive Greece took its rude captor captive). The early Roman Church was but a colony of Greek Christians or Grecized Jews. The earliest Father of the Western Church wrote in Greek. The early popes were not Italians but Greeks. The name of the pope is not Latin, but Greek, the common and now despised name of every pastor in the Eastern Church. …. She is the mother and Rome the daughter. It is her privilege to claim a direct continuity of speech with the earliest times; to boast of reading the whole code of Scripture, Old as well as New, in the language in which it was read and spoken by the Apostles. The humblest peasant who reads his Septuagint or Greek Testament in his mother-tongue on the hills of Boeotia may proudly feel that he has access tot he original oracles of divine truth which pope and cardinal reach by a barbarous and imperfect translation; that he has a key of knowledge which in the West is only to be found in the hands of the learned classes. "God spoke his revelation in the world of the Greek spirit and the Roman imperium and the Church guards this truth framed in the Greek speech of her sacred Book…The Church will continue to speak Greek even if…Hellas descend into the abyss of utter oblivion." "The task of our time, in the Orthodox world, is to rebuild the Christian-Hellenic culture, not out of the relics and memories of the past, but out of the perennial spirit of our Church, in which the values of culture were truly christened. Let us be more Hellenic in order that we may be truly Christian. Anastasios Anastassiadis. Religion and Politics in Greece: The Greek Church's 'Conservative Modernization' in the 1990's. Research in Question, No.11, January 2004. (pdf format). E. P. Blegen. Earliest Christian churches in Athens. American Journal of Archaeology v. 50 (July 1946) pp.373-75. George T. Dennis. The Late Byzantine Metropolitans of Thessalonike. Dumbarton Oaks Papers no. 57 (2003) pp.255-64. The Orthodox Church of Greece. Catholic Near East Welfare Association (CNEWA) website. Library of Congress - Federal Research Division - Country Studies - Greece (See section on RELIGION: Orthodox Church of Greece). Ultima editare a paginii a fost efectuată la 20 decembrie 2018, ora 09:51. Pagina a fost accesată de 18.410 ori.